Dingman Falls is the second highest waterfall in PA.
Spring thaw means rushing waters in the Lake Wallenpaupack region. The area is blessed with an abundance of waterfalls and there’s no better time to take in the show produced by Mother Nature. Make Ledges Hotel home base for your waterfall tour and you have a front row seat to the Wallenpaupack Creek Falls. The contemporary boutique hotel is perched on the river gorge offering spectacular views of the waterfall from its multi-tiered decks. Some guest rooms even overlook the falls affording visitors a round-the-clock exclusive view. When you’re ready to explore the outdoors, use this guide to all the show-stopping cascades found throughout the Pocono Mountains. Possibly one of the Northern Poconos best kept secrets, even though it’s situated along one of the area’s main roads. Located in State Game Lands 180, there’s a parking area along Route 6 near the town of Greeley for those who wish to explore. Then it’s a short walk along a forest trail to two stone-walled observation points. The creek flows from Shohola Lake, so the volume of water flowing over the falls is usually consistent any time of year. The width of the falls makes it an impressive sight as the water tumbles roughly 50 feet down over rock ledges. The trek to the falls and back is just under a mile and the trail is well traveled. Silverhead Falls in Delaware Water Gap National Recreation Area. A flat boardwalk trail makes this distinctive waterfall accessible to everyone. Located in Delaware Water Gap National Recreation Area, Dingman Falls is the second highest waterfall in Pennsylvania. The trail traverses a hemlock-lined ravine. Keep an eye out for Silverhead Falls. Measuring 80 feet in length, Silverhead Falls is a worthy preview to the main attraction. The boardwalk continues through dense rhododendron bushes before arriving at the base of Dingman Falls. Gaze at the falls from an observation deck as it crashes 130 feet to the base of the ravine. Take the staircase to get a birds-eye-view from the upper falls, which are spectacular during the spring thaw! This is the star of the Northern Pocono Mountains region! 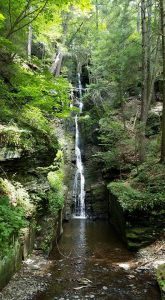 Raymondskill ranks as the tallest waterfall in Pennsylvania. It cascades over rocks in three tiers. When the distance of all three tiers is added together, the waterfall measures just a few feet shy of Niagara Falls. While the hike is short, the trail is rated as easy to moderate. The climb to the first observation area is steep and uneven. At the first observation point you get a view of an upper pool and the top of one of the cascades. The lower viewing area offers unparalleled views and makes for a great photo op. Raymondskill Falls is in Delaware Water Gap National Recreation Area near Milford, PA.
What this falls lacks in height, it makes up for in natural beauty. A moderate 1.4-mile one-way hike in Delaware Water Gap National Recreation Area leads to the fan-shaped falls. Trek through rolling hills and a forest of mixed hardwoods and hemlocks to get a glimpse of Hackers Falls. Access the trail from the Cliff Park Trailhead near Milford, PA. Located on the New Jersey side of Delaware Water Gap National Recreation Area, Buttermilk Falls ranks as one of the tallest waterfalls in New Jersey. 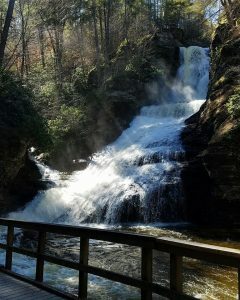 The 1.4-mile one-way hike climbs to the top of the waterfall and continues on a steep trek along the National Appalachian Scenic Trail to reward hikers with spectacular views. This waterfall is part of a three-mile loop trail in the Pocono Environmental Education Center (PEEC) area. The hike is rated moderate to difficult and offers many points of interest. There’s an overlook of the Delaware River and Kittatinny Mountains in New Jersey as well as lush mixed growth forests and a pond. A series of switchbacks leads to the waterfall. Remnants of a farm are also visible along the trail. PEEC is located in Dingmans Ferry. Another must-see waterfall in Delaware Water Gap National Recreation Area. A moderate 1.6-mile hike traverses the water’s edge and features many cascades before reaching the main falls. Van Campens Glen is found in historic Millbrook Village, across the Delaware River in New Jersey. A popular trail in Promised Land State Park in Greentown. This 2.4-mile loop trail is a fairly easy, picturesque walk. The trail meanders along Wallenpaupack Creek, past a lake and over footbridges before arriving at the scenic Little Falls. Much of the trail follows an old road that travelers once took to Mauch Chunk, PA- present day Jim Thorpe. This hike in Hickory Run State Park is just over a half mile but rated difficult due to the inclines. Rhododendron bushes are dense along both sides of the trail, so this hike is particularly beautiful when the blooms are in season in late May. Hikers will cross a footbridge before getting a spectacular view of the 25-foot waterfall. The Austin T. Blakeslee Natural Area is home to this scenic waterfall. Although not very tall, it is mighty and a sight to behold. The half mile forested trail includes a few stream crossings. The waterfall empties into a deep pool, which is a popular spot for fishing. The 130-acre natural area is a favorite recreation spot in Monroe County. This may be the most well-known waterfall attraction in the Pocono Mountains region. Dubbed, “the Niagara of Pennsylvania,” Bushkill Falls features eight spectacular waterfalls connected through a series of woodland trails, boardwalks and bridges. Visitors traverse a trail system that encompasses a 300-foot drop from the main falls to the lower gorge. The tallest of the waterfalls- Majestic Falls descends 100 feet. Observation decks offer spectacular vantage points to view the falls and snap some photos. Visitors have flocked to Bushkill, PA since 1904 to witness this natural wonder. Most people visit Beltzville State Park for its 1,000-acre lake. But the park is also home to the scenic Wild Creek Falls, accessible via a trail that’s just over a mile long. The wooded walk is fairly easy but does have some steep inclines. Hikers traverse Wild Creek and cross a footbridge before arriving at the falls. Although not very tall, the water tumbles over large boulders, making this waterfall particularly scenic. This lesser known waterfall located in State Game Lands 159 outside of Honesdale was once home to several thriving mills. Remnants from the mid-1800s era buildings are still visible. Dyberry Creek cascades about 20-feet down over two tiers of rock ledges. The narrow trail leads to a rocky outcrop offering a birds-eye-view of Tanners Falls. Remember, trails in state game lands may not be as well maintained or marked. Use caution when hiking. Take advantage of our Waterfall Tour Package, which includes a two-night stay, breakfast each day at our sister property, The Settlers Inn, vouchers for lunch at Cocoon Coffeehouse and Bakery and dinner at Glass wine.bar.kitchen. We even include a table cloth if you want to take your lunch to go and find a scenic picnic spot. Cocoon Coffeehouse and Bakery is adjacent to the hotel and has a mouthwatering selection of sandwiches, sweets and snack essentials to fuel your explorations. The package also includes use of walking sticks and backpacks.